If you thought your denim had seen its last days, think again. Regardless of how tattered your denim jeans or denim jackets may be, don’t throw them away! 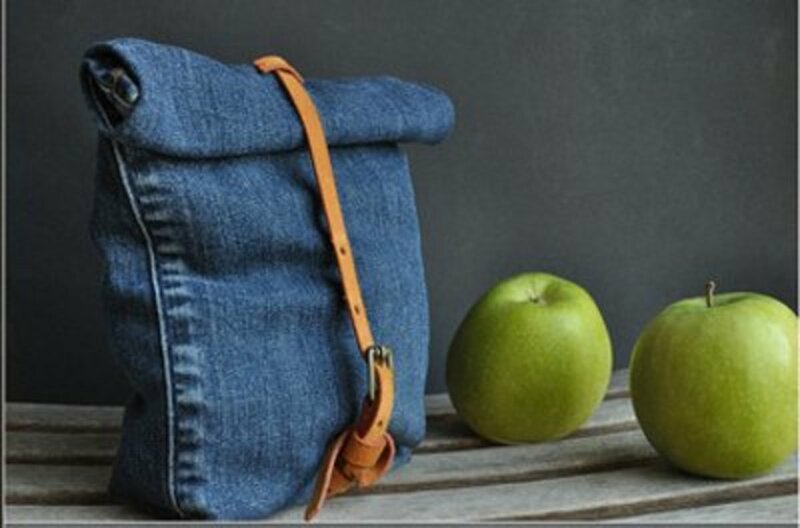 In fact, your denim is most definitely not a lost cause, as there are many ways to reuse the classic and durable material. 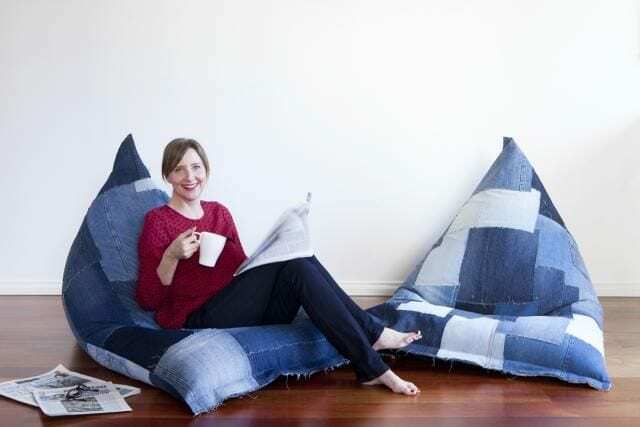 We’re sharing 40 of the most creative ways to repurpose old denim you have in your closet right now. Bringing wine as a gift is always a great gesture. 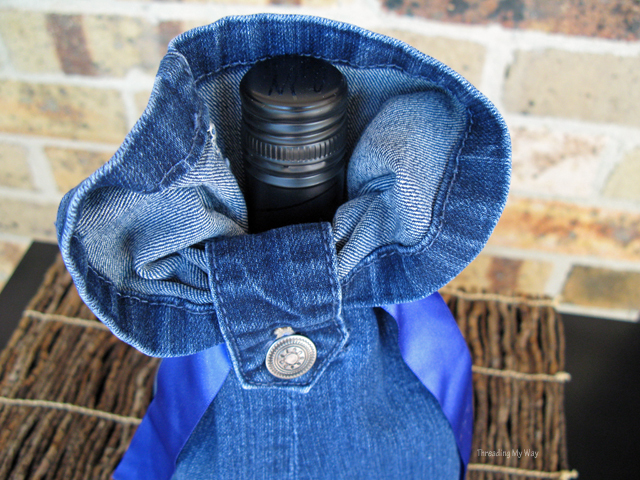 Repurpose distressed denim to create a denim wine bag. Using scissors, snip denim and sew the bottom to ensure the glass bottle is supported. Pro tip: if you’re not great at sewing, use a stapler to get the job done. This is perfect for those who love to travel. 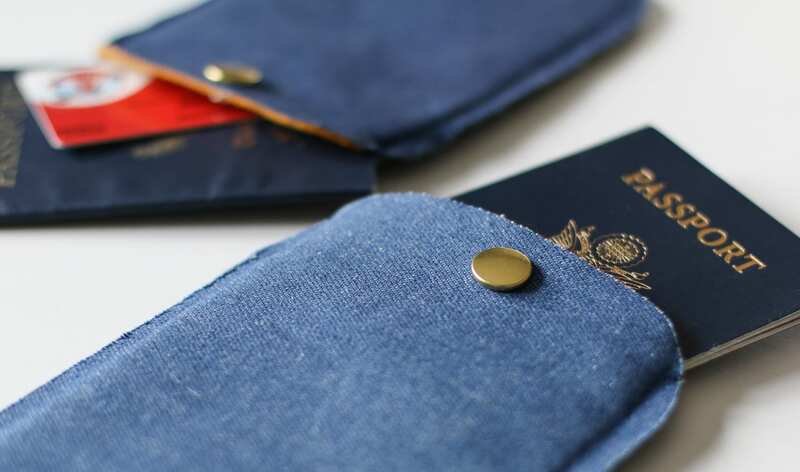 Construct this simple denim passport carrier, without sewing. Simply use hot glue to paste denim pieces together, and add a snap button for additional security. Halloween is here! 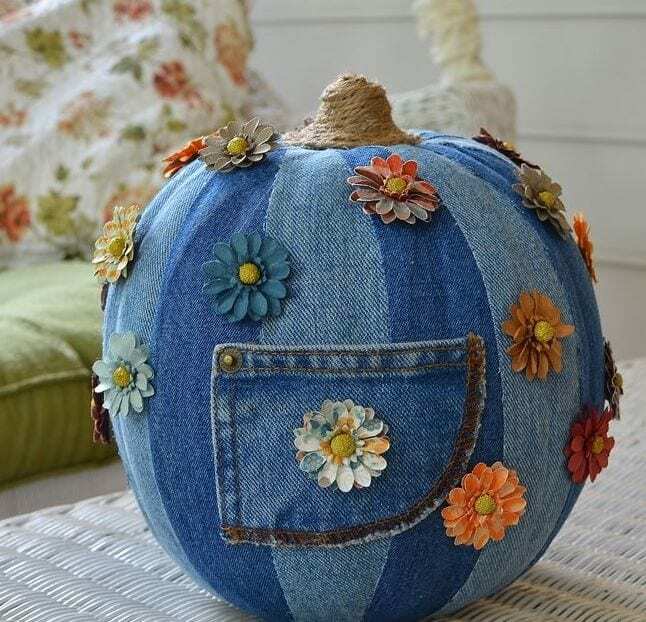 Greet trick or treaters with denim pumpkins, repurposed from old denim. This is a perfect craft for the Fall season, and is a great way to spruce up your porch. 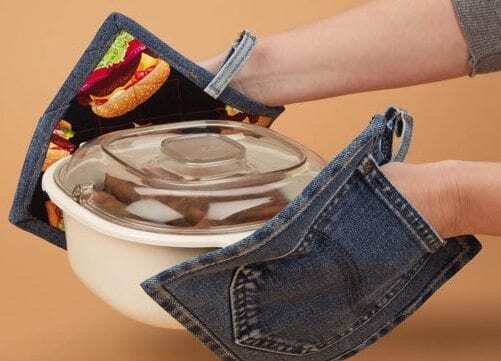 Keep hands protected by fashioning denim pot holders for cooking. The denim’s handy pockets serve as a perfect place to slip hands into, ensuring a solid grip. 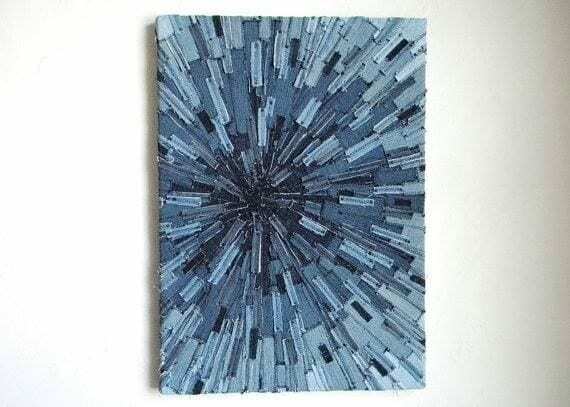 Recreate a unique piece of wall art using recycled denim. Simply cut up denim in different shapes and sizes, artistically creating your own design. The kitchen can get messy. 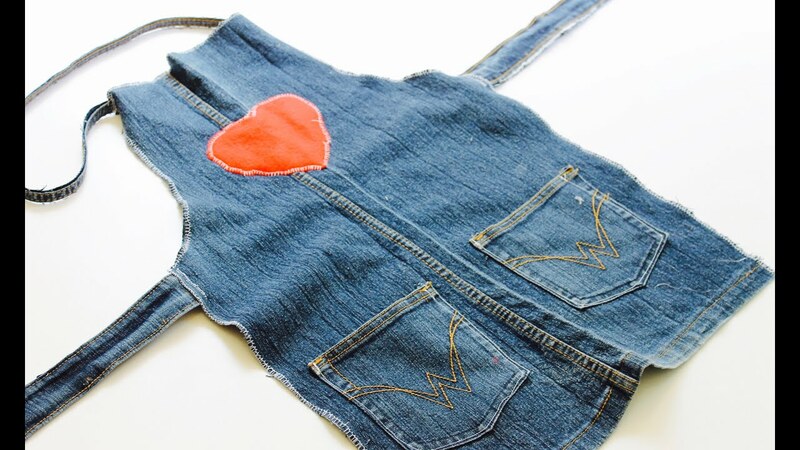 Reuse old denim to make a denim cooking apron. Bon appetit! 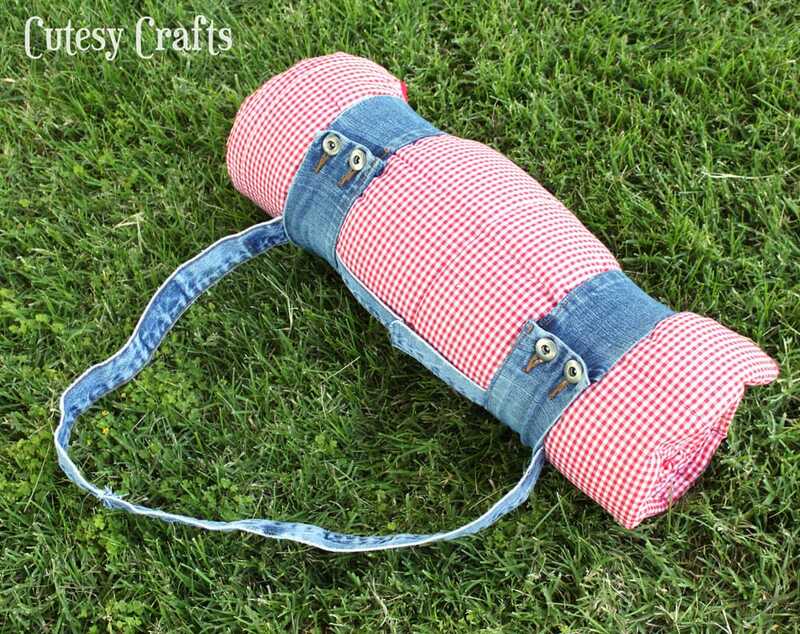 Cover a worn pillow with a denim shirt, without having to cut it. This creative DIY is sure to have friends and family ask where you purchased this unique pillow. 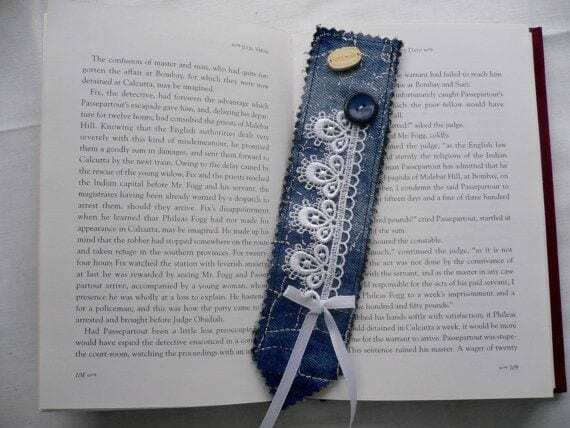 Craft this cute and creative denim bookmark using recycled denim. 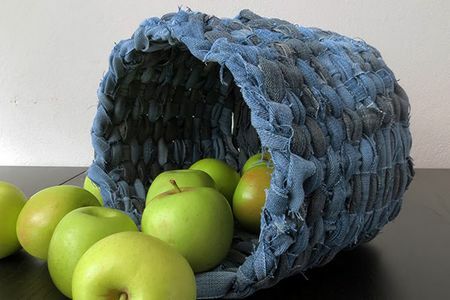 This denim basket can be used to hold various items. Depending on the size of your basket, you may need more than one pair of jeans. 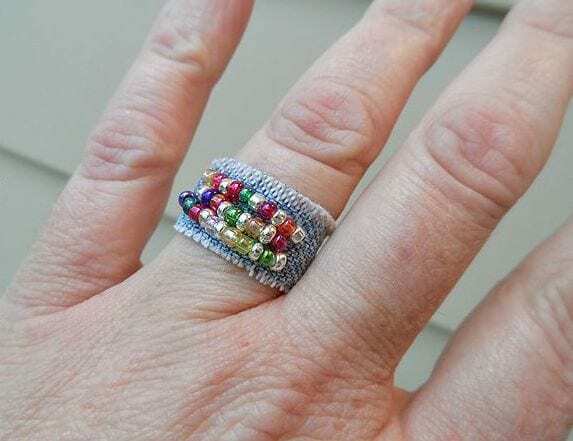 Craft a colorful beaded ring using distressed denim. This is a perfect slumber party activity as it’s fun and easy to make. 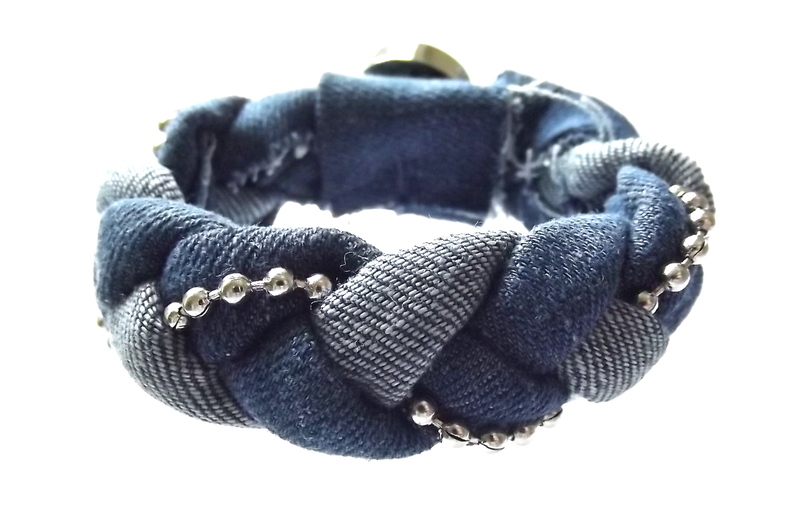 Braid strips of old denim to craft this stylish bracelet. 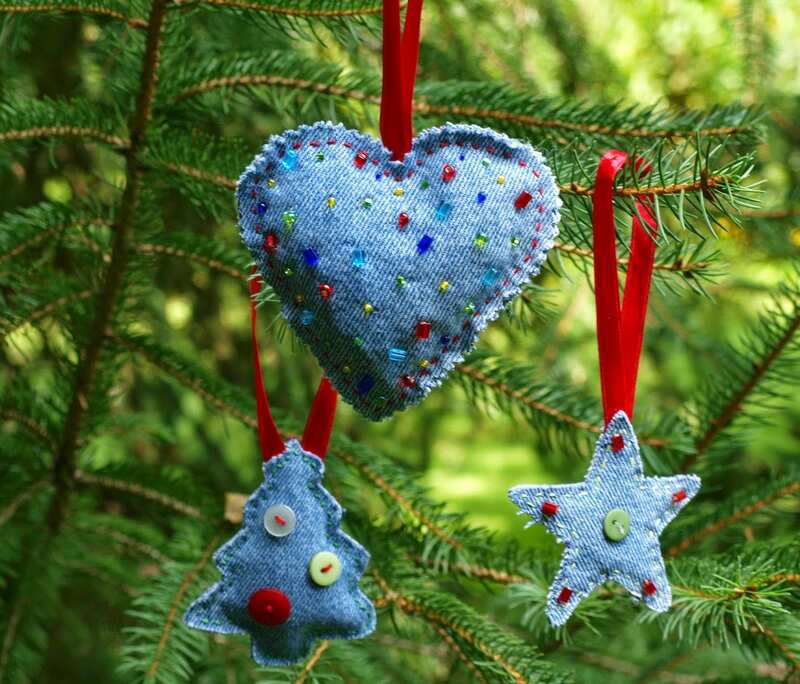 And, add additional embellishments for sparkle. 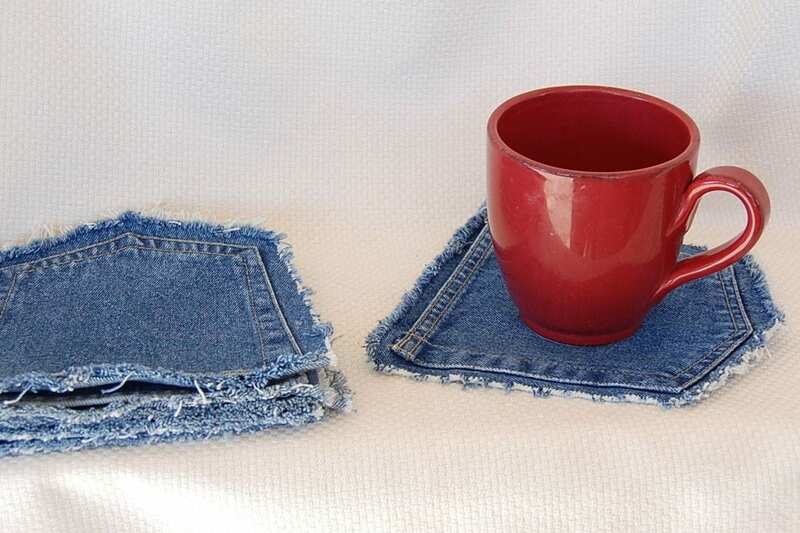 Create fun drink coasters using the pockets of distressed denim. 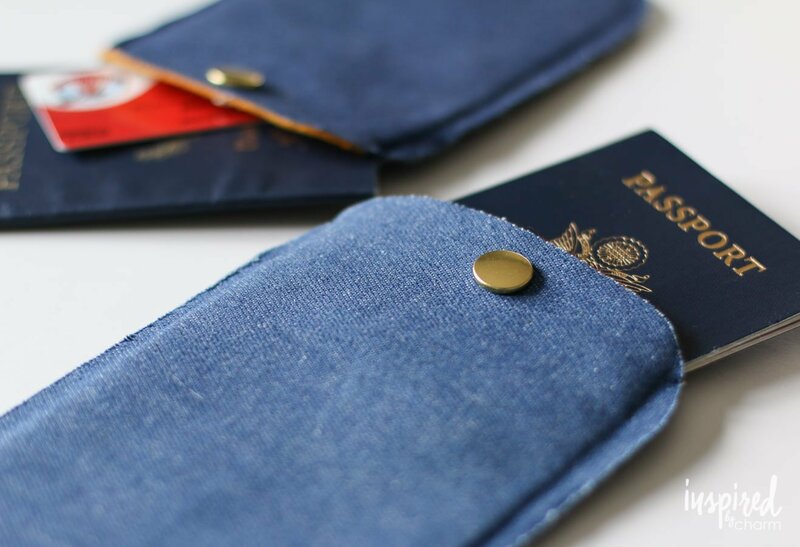 Simply cut denim pockets and use immediately. If the edges are frayed, no problem, it’s part of the vintage aesthetic. 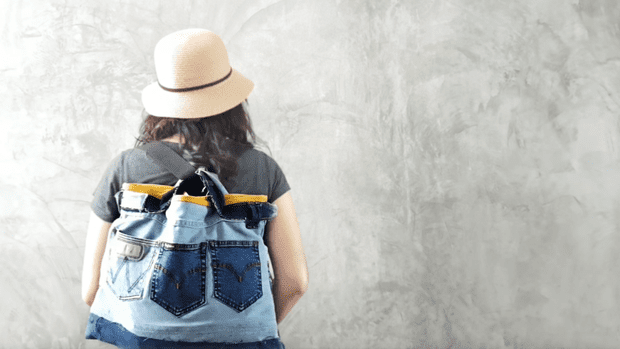 Craft a eco-friendly backpack by upcycling old denim. This DIY may take a little more time, but the outcome is so worth it. 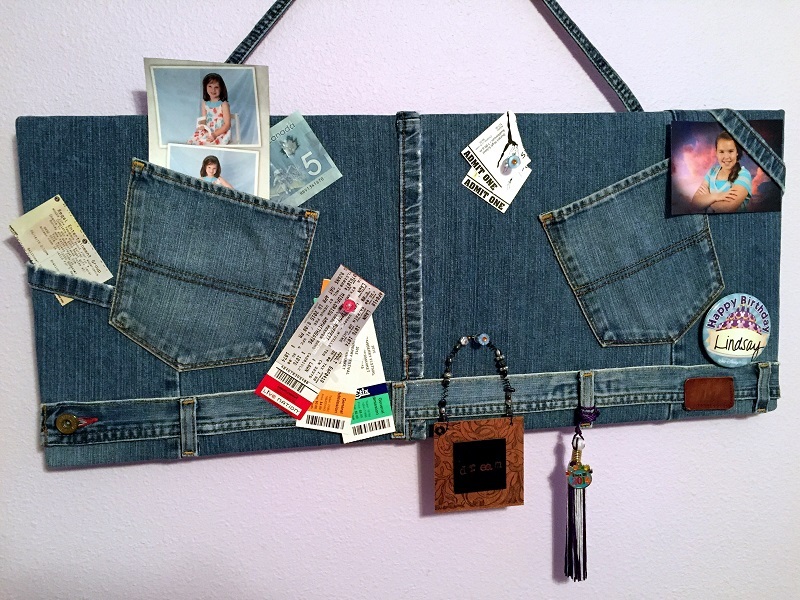 Organize photos and your favorite memories by crafting a denim bulletin board. All that’s needed is a cork board, worn denim, and hot glue. Love this! Sew various pieces of denim together to construct this eclectic denim quilt. 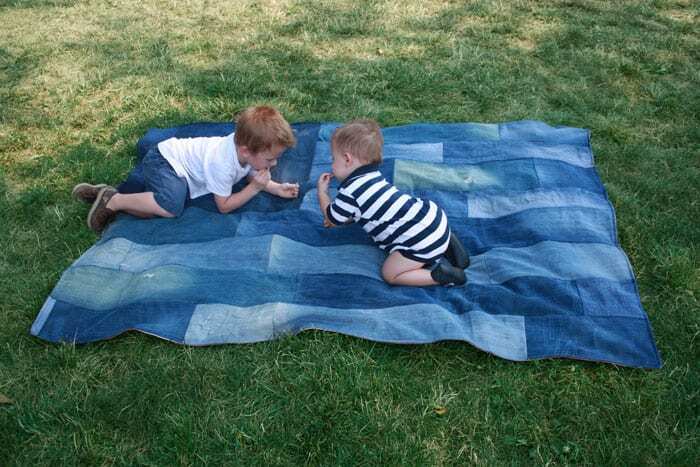 With the durability of the denim, the quilt can withstand the outdoors and can easily be washed. 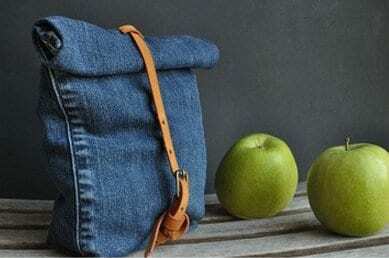 Forgo the traditional brown paper bag, and opt for a fashionable denim snack bag to carry your lunch or other snacks. Trust us, this snack bag will make quite a statement in the lunchroom. It’s inevitable that babies will drool, spill, and just make a mess. But, there’s no need to worry! 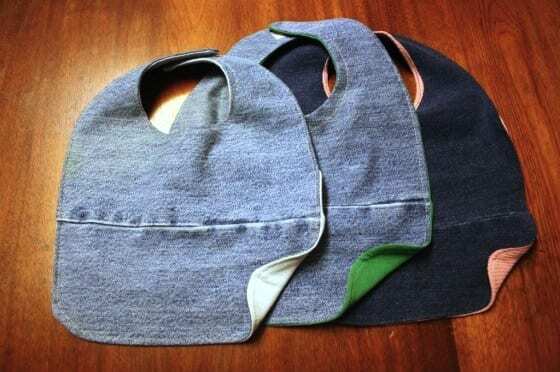 Craft an economical, denim baby bib using old jeans. Create this striking lampshade by weaving together pieces of repurposed denim. This unique lampshade is eye-catching, and sure to be the centerpiece any room. 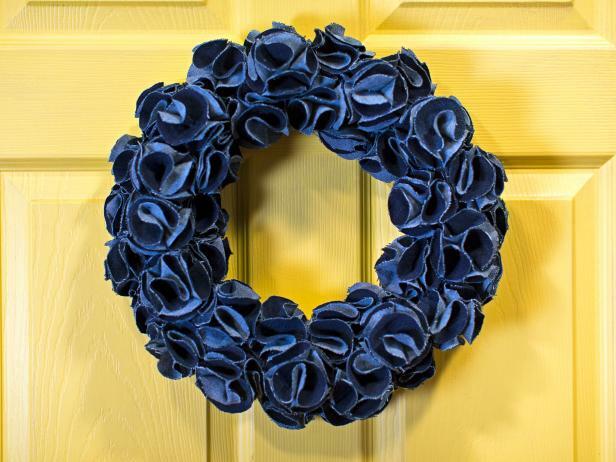 Welcome and wow guests by crafting a denim wreath. 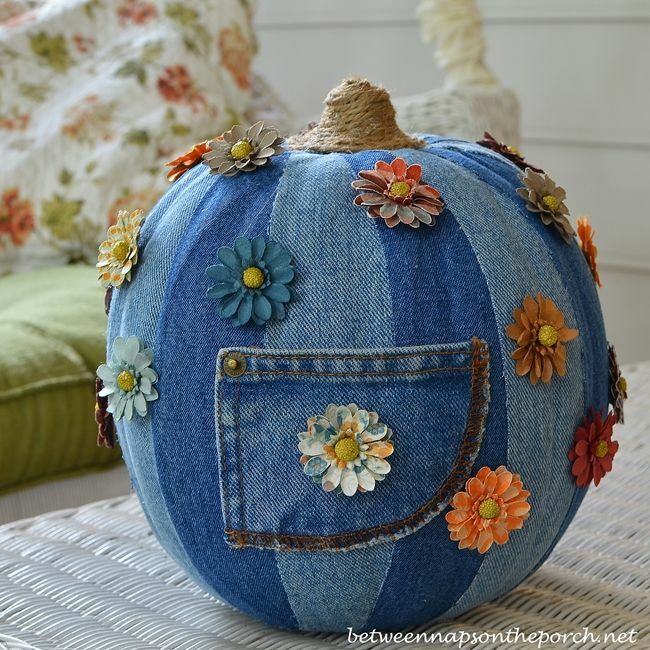 Use circular foam as a base, cutting and folding denim in a flower-like pattern. Use hot glue to layer the flower pieces on top of one another. How cute! 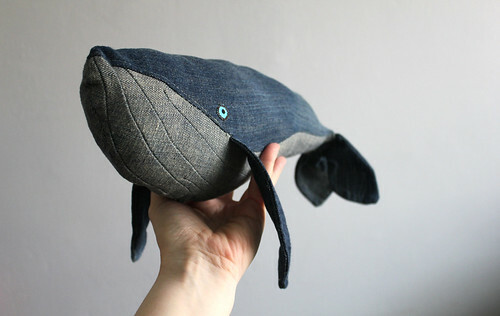 Use soft denim and intermediate sewing skills to craft this adorable plush toy. 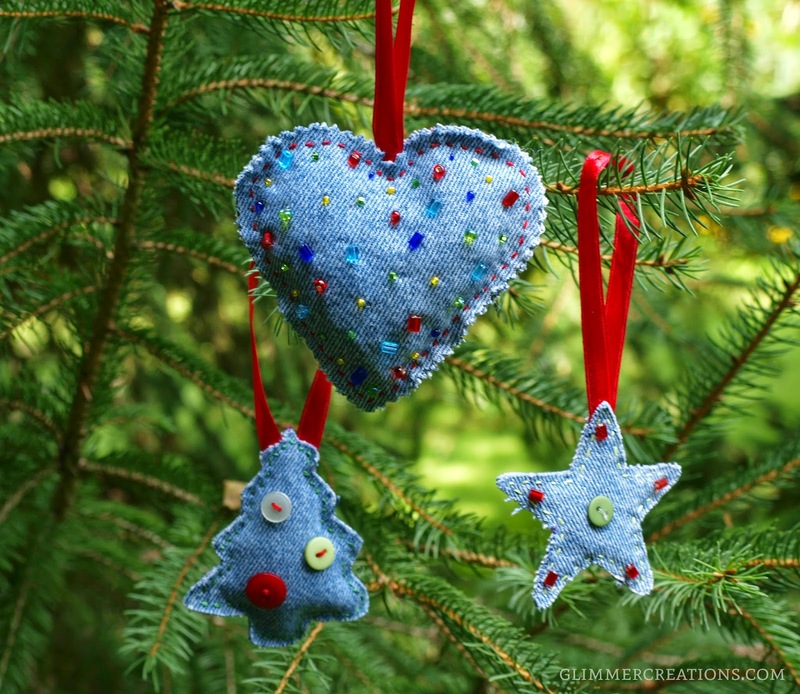 Create one of a kind denim Christmas ornaments. Craft different shapes and sizes for varied assortment. 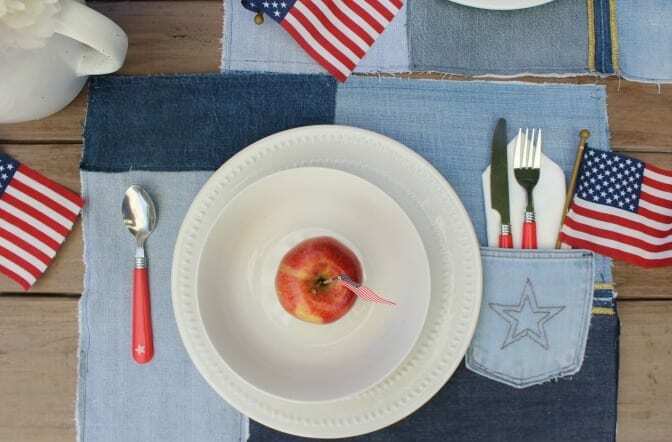 Host a memorable dinner party by creating table placemats from old denim. 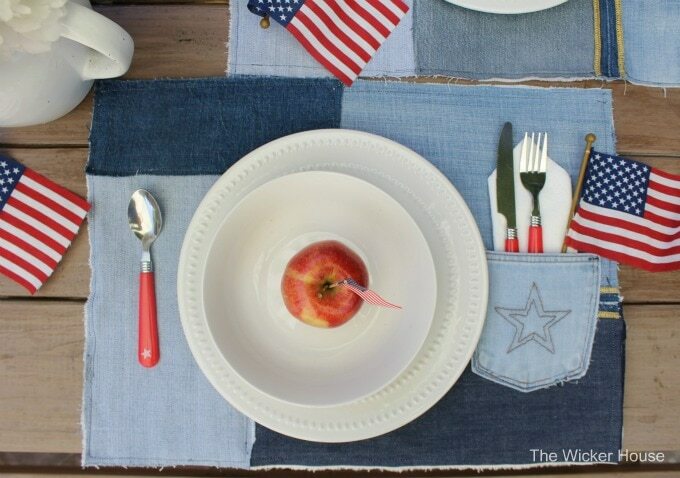 Utilizing the pocket as a utensil holder, this craft is sure to wow guests and have them asking where you got them from. While this DIY looks complicated, it is actually fairly simply. 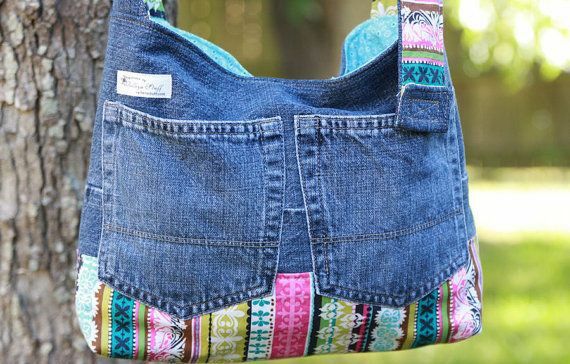 Convert old, unused denim into a fashionable handbag. Add fun patchwork to personalize the accessory. 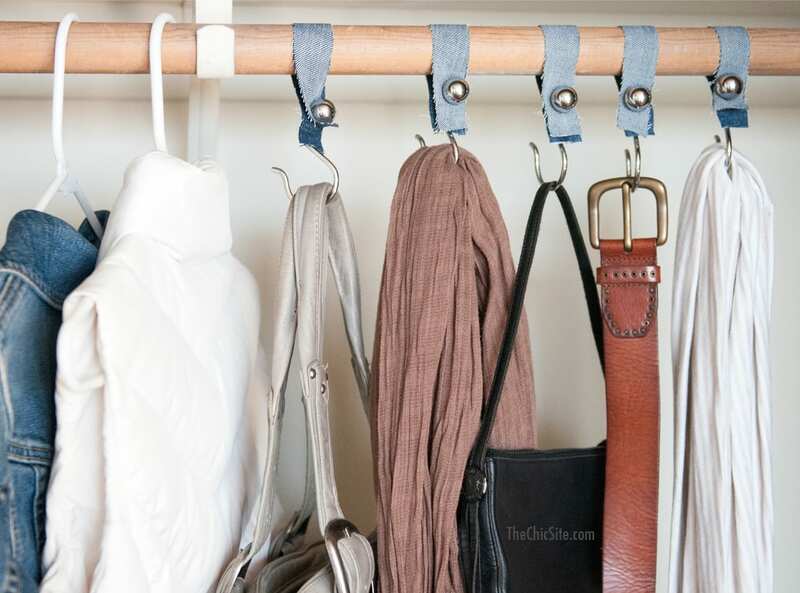 Hang your favorite accessories using recycled denim. Construct this accessory hanger using shower curtain hooks and a hole punch to create a useful appartus. Let the organization begin! Love your denim jeans, but the ends are tattered and torn? Simply cut jeans to convert them into stylish denim shorts. 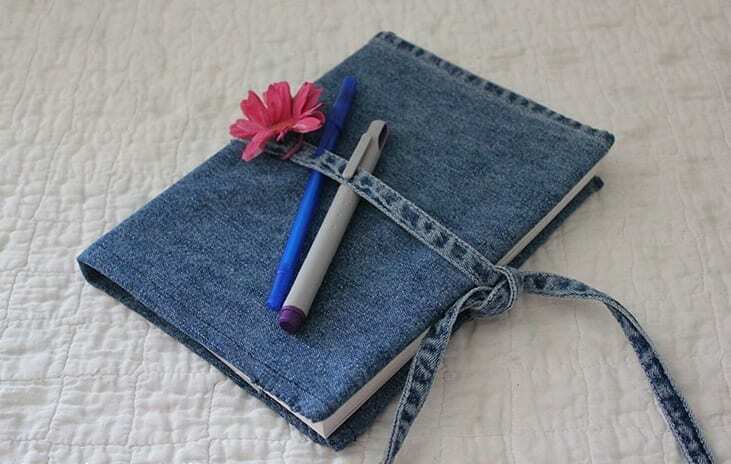 Repurpose used denim by covering your favorite novel or notebook. Simply sew or staple the hem to fit the book accordingly. How awesome! Sit back and relax in this chic denim bean bag. Christmas is right around the corner. 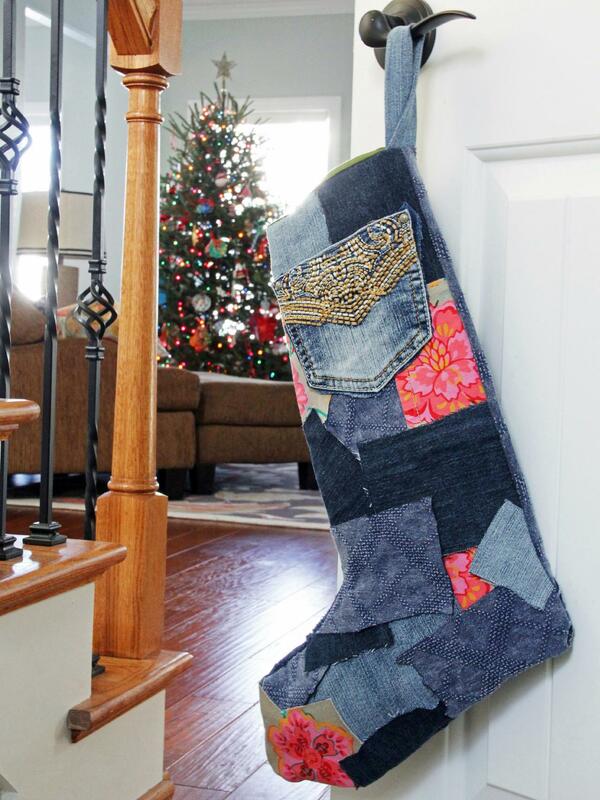 Craft a unique Christmas stocking this holiday season using old denim. This DIY is perfect for Fall’s changing seasonal weather. Cut and crochet denim to craft a one of a kind denim scarf. 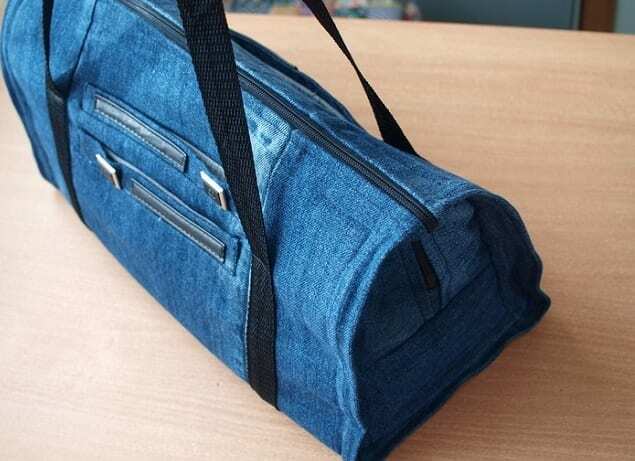 The durablilty of denim makes it a great material to use as a duffle bag. Now, you’re ready to break a sweat. 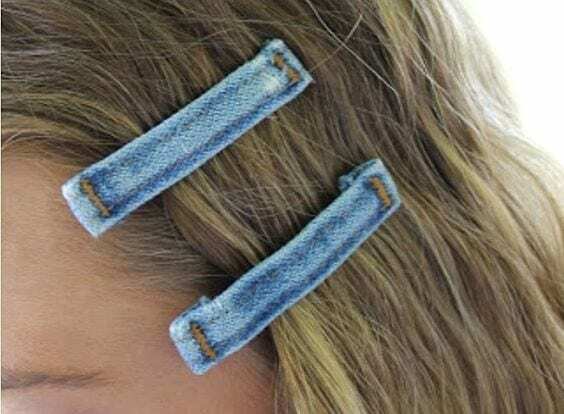 Customize hair accessories by reusing old denim. 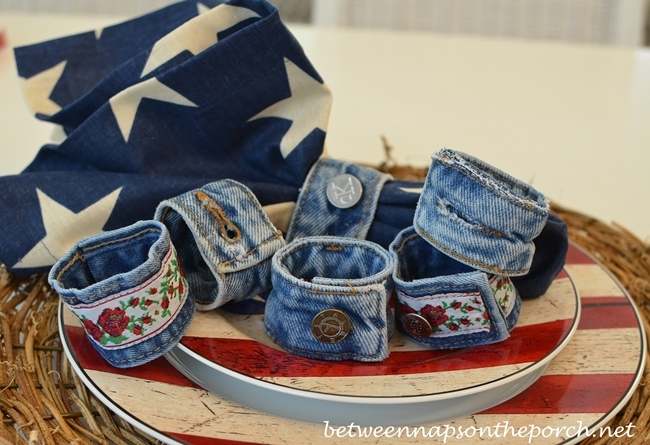 Simply trim belt loops from your denim piece and hot glue the loop to hair clips. Once dried, clip the hair accessories into hair and enjoy. 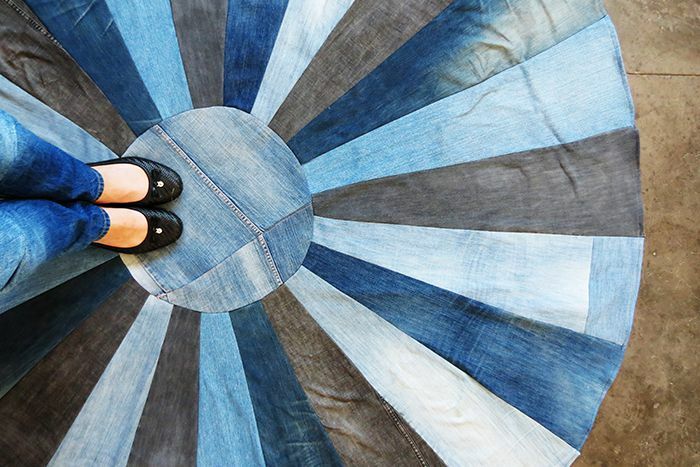 Craft a cool denim rug for your home or office using old denim. 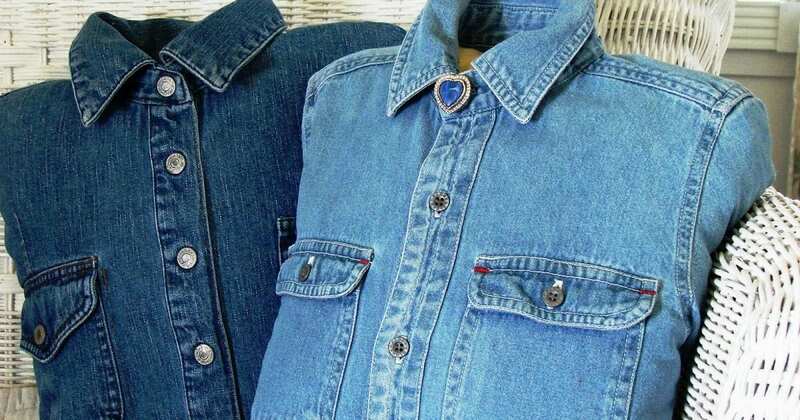 Simply sew various denim pieces together in a pattern of your choice. This is a great way to add color to any room. 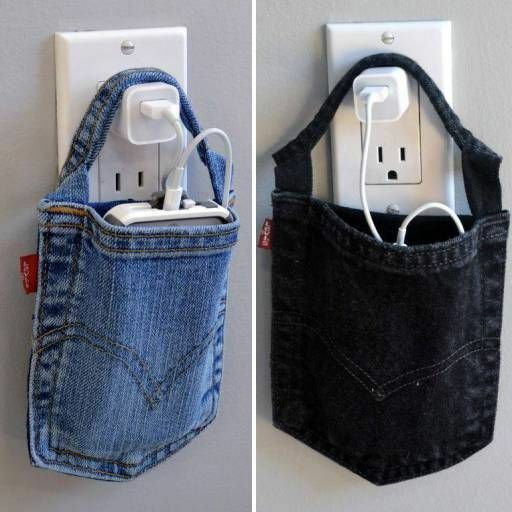 Charge your cell phone conveniently using a denim pocket. Simply trim the pocket, using the excess material to hang around the base of the charger while it’s plugged into an outlet. This is an awesome hack! 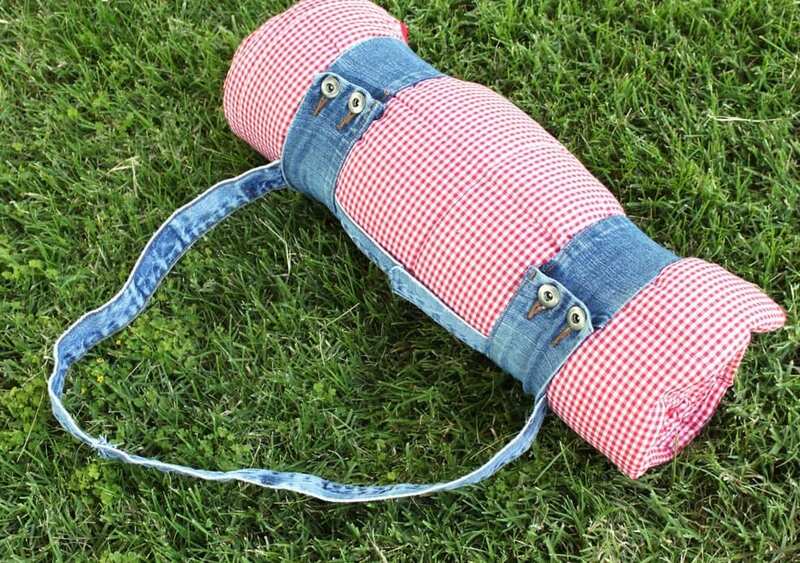 This useful carrier is perfect for carrying a picnic quilt, or even a yoga mat, on-the-go. Quickly roll up your favorite blanket or mat and head out the door. This is country chic at its finest. 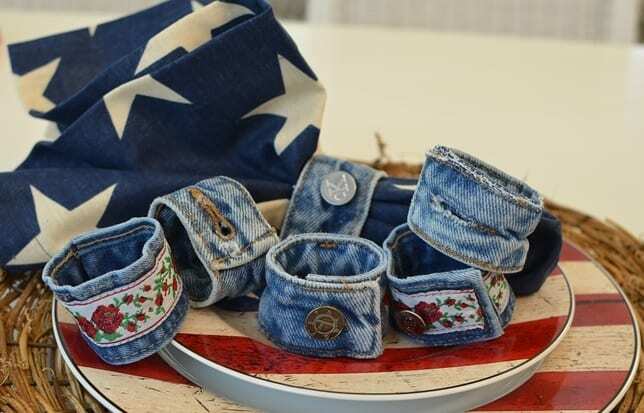 Impress guests at your next dinner party by crafting these unconventional napkin rings made from upcycled demin cuffs. 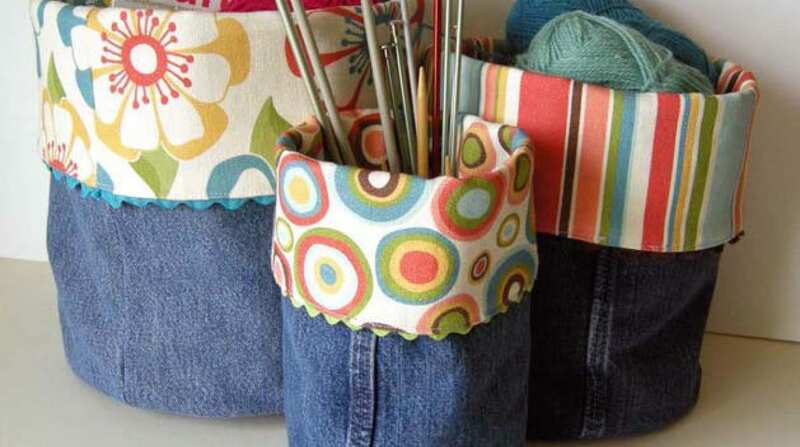 Construct denim bins in a few easy steps. These bins are so versatile, and can be used for anything you may need. 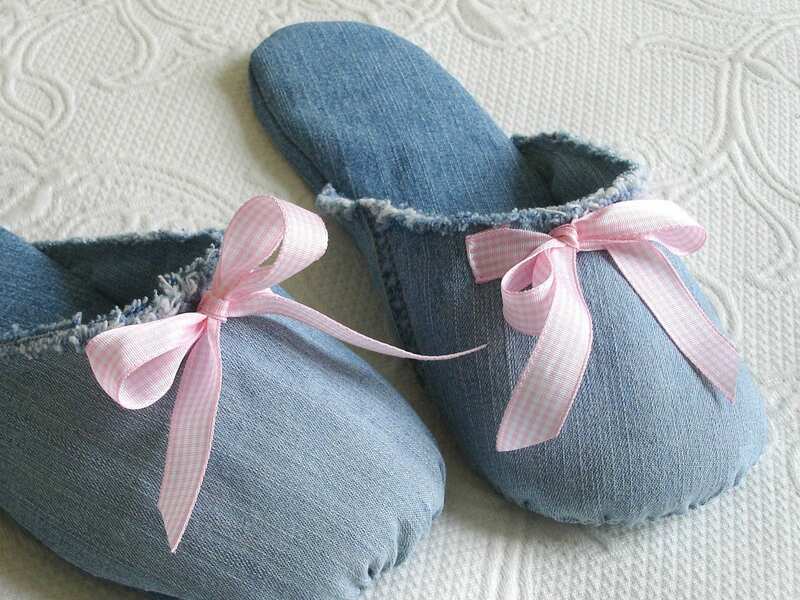 Look, and feel, adorable around the house by crafting these stylish slippers. Print out pattern pieces and sew denim accordingly. Make this cute denim necklace by simply trimming unused denim to comfortably fit around your neck. 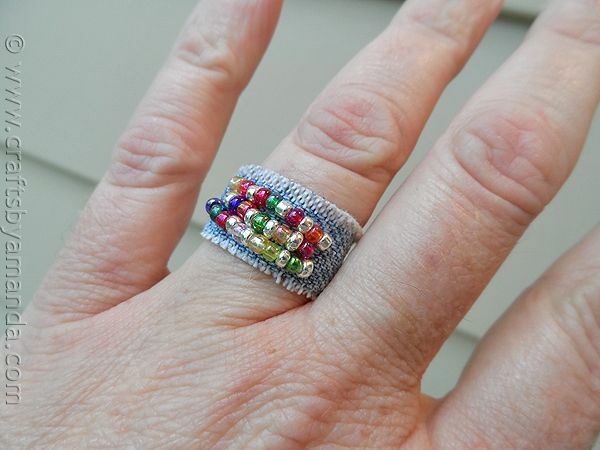 Add rhinestones or embellishments to enhance style.